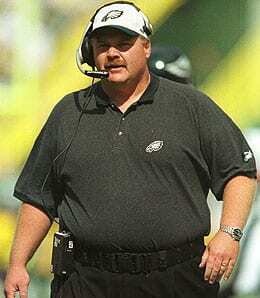 Andy Reid is certainly built to survive in cold weather, but unfortunately his Eagles couldn’t make the same claim. Days before the Arizona Cardinals nearly applied a death blow to Steeler Nation, the Pro Football Hall of Fame, in conjunction with Coors Light, released its list of the 10 coldest games in NFL history. A panel of some of the NFL’s all-time greatest players narrowed their selection down to 10 epic contests. When asked about the bone-chilling 10 games RotoRob’s reaction perhaps best summed up the players’ sentiments. Memorable Moment: Tom Brady + Best Patriots Defense during the Bill Belichick era = Home Field Advantage; Steve McNair + physical defense – washed up Eddie George = good team that cannot score quite enough. Memorable Moment: In the game’s critical sequence, Bronco running back Rob Lytle took a handoff, dove towards the goalline and fumbled. Raider defensive tackle Mike McCoy scooped up the ball took off towards the end zone. Unfortunately for the Raiders, the play was blown dead and the officials claimed Lytle never fumbled. Television replays suggested otherwise (back in the ’70s, the instant replay was still a decade away from becoming reality). Denver scored on the next play. Oakland eventually fell 20-17. Years later, it was revealed that Raider defensive tackle John Matuszak was bothered not by the cold weather but instead partying a bit too hard a night earlier. The Broncos got word of it and took advantage. Memorable Moment: The weather proved to be the game’s defining factor with winds up to 40 miles per hour. Jim Taylor scored the game’s lone touchdown for Green Bay, while offensive lineman Jerry Kramer booted three field goals to secure the Pack’s second NFL title. Memorable Moment: Unless you lived under a rock for the past 10 years, this is known as the “Tuck Game” and is mostly noted for the ill-fated call that eventually turned a Brady game-ending fumble into a mystifying game-tying field goal by Patriot kicker Adam Vinatieri. This is the game that got the Patriot dynasty off the launching pad and started to turn that Brady fellow into a star. Memorable Moment: A brief interlude if I may…one of my friends refers to Brett Favre as ‘old red nose’ for his penchant to resemble Rudolph the Red Nosed Reindeer during games in this type of weather. With the Giants reeling and the Packers controlling the ball in overtime, Rudy with his nose so bright fired his final pass at Lambeau Field as a Packer…into the hands of Giant cornerback Corey Webster. A few plays later, the Giants went to Super Bowl XLII and one of America’s greatest mini-series began: Brett Favre Holds America (and the Packers) Hostage! Memorable Moment: The best moment of the game, besides the fans storming the field like lunatics, came prior to the start of the game. It was alleged by Raider owner Al Davis that the Steeler grounds crew didn’t take the best care of the Astroturf at Three Rivers Stadium. In fact, Davis believed that the crew allowed tears to occur in the tarp covering the field. The precipitation that hit the area that week led to patches of ice all over the field. Thus, Oakland’s greatest offensive asset – team speed – was deemed moot. With the Oakland aerial assault grounded, the Steelers won the AFC title 16-10 and eventually defended their world title. Memorable Moment: Another Raider entry? Are we sure this poll wasn’t conducted by Steeler fans looking to highlight Raider shortcomings? It does seem a little bizarre that a somewhat warm weather team like the Raiders has been involved in this many frozen classics. At any rate, when the clock hit zero in the fourth quarter, the Bills vanquished the Raiders and advanced to another AFC title game. Soon after the game, you could hear America collectively groaning “oh no, here we go again.” At least for Raider fans that day it wasn’t another 51-3 debacle. Memorable Moment: The game itself wasn’t very good. However, seeing players try to catch the ball in this weather was almost laughable at times. Making matters worse for San Diego was the fact that it had just been in the epic playoff tilt against Miami a week earlier. In these conditions, the Chargers laboured to score points. By the way, I’ve never understood the pandering towards the ’81 Chargers that occurs from time to time. They played poor defense, weren’t a great running team and were by and large one-dimensional. Sure, they had skill players, but that doesn’t always pay the bills in the clutch. Memorable Moment: The weather tales from this one are legendary. Cowboy Hall of Fame receiver Bob Hayes ran pass patterns with his hands in his pants. Meanwhile, a referee had a whistle stick to his lips. As for the game, the Packer dynasty — on its last legs — outlasted the Cowboys for the second straight season to win the NFL championship. Green Bay quarterback Bart Starr snuck in from one yard away to give Green Bay its last NFL title under head coach Vince Lombardi. Everyone is so quick to romanticize the ’58 NFL title game, but this is the definitive game in league history. While maybe not as influential, it’s one of the most historic battles of all time.